In this policy the expressions “we”, “us” and “our” are a reference to Prolancer. The expressions “you” and “your” are a reference to our valued customers. We make a considerable effort to keep you, our valued customer, informed of the progress of your order. We send you progress updates via e-mail or, in the case when e-mail is not available, we phone you when your order progresses in the processing queue. An order for ICT products goes through a number of different status states. This whitepaper explains the states and the triggers that cause orders to progress from one state to the next. We hope that you will find the information useful and that it will simplify your experience with Prolancer. The subsequent figure shows the status states for every order for ICT products. Explanation of every state follows the figure. All orders for ICT products start in the “New” state. This state simply means that we have received the order and that we have placed the order in the processing queue. You will receive a copy of our Product Sales Order which will show the ICT products that you ordered, quantities for each product and base cost (excluding applicable taxes, surcharges and logistics costs) when your order enters this state. The sales order will contain the billing and delivery addresses as well. If the information on the update is incorrect, you should contact us immediately. Your order will remain in the “New” state until we determine the exact costs of applicable taxes, surcharges and logistics. When we know these costs, we will generate an invoice for your order and progress your order to the “Invoiced” state. We sell to an international market and deliver products from various locations (warehouses) in Australia and sometimes other countries. Our aim is to minimize the additional costs such as surcharges and logistics when we generate the invoice. Unfortunately, we can not do the same for taxes. You will receive a Product Invoice when your order enters this state. The invoice will show the total cost (including taxes, surcharges and logistics). At this point you have the following choices: you can either cancel the order (no fee applies) or pay the amount shown on the invoice. If you cancel your order after receiving an invoice from us, then your order enters the “Cancelled” state. This is a final state for an order. If you later change your mind and wish to proceed with the order, then unfortunately we ask you to create a new order for the same products. Your order will remain in the “Invoiced” state until we receive a payment (in full) from you or for seven (7) calendar days from the order date - whichever occurs first. If we do not receive a payment (in full) from you, your order will transition to the “Cancelled” state automatically after seven calendar days from the order date. However, your order will enter the “Paid” state when we receive a payment (in full) from you. You will receive a copy of the original Product Invoice when your order enters this state. 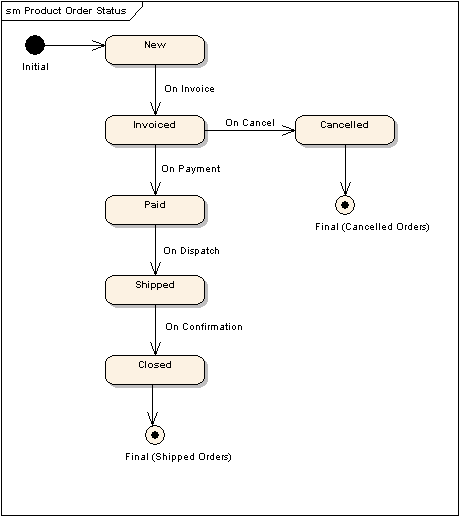 The invoice will show that you have made the necessary payment. Your order will remain in the “Paid” state until we make the necessary arrangements for the delivery of the products to your nominated delivery address. When the products leave the warehouse, your order will transition to the “Shipped” state. You will receive an Order Status Update that shows the expected delivery date. One (1) calendar day past the expected delivery date, you will receive a curtsey communication from us to confirm the delivery of the products. If all is well, your order will transition to the “Closed” state. This is the final state for your order. From time to time, we may change our policy on how we handle orders for products that we sell. Any changes to our policy will be published on our website. You should visit these pages from time to time to determine the current policy.